Of God and Holy Water (by Rajeev Srinivasan at Rediff.com). A ‘web trove’ of India’s glorious past (by N S Soundara Rajan at deccanherald.com). 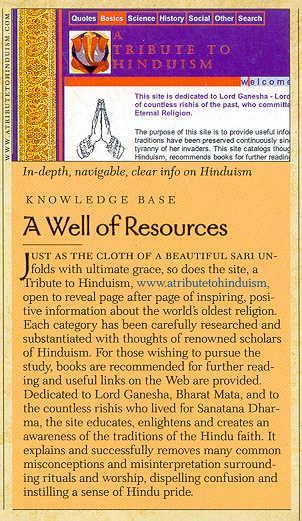 Just as the cloth of a Beautiful sari unfolds with ultimate grace, so does the site, a Tribute to Hinduism, www.atributetohinduism.com, open to reveal page after page of inspiring, positive information about the world’s oldest religion. Each category has been carefully researched and substantiated with thoughts of renowned scholars of Hinduism. For those wishing to pursue the study, books are recommended for further reading and useful links on the Web are provided. Dedicated to Lord Ganesha, Bharat Mata, and to the countless rishis who lived for Sanatana Dharma, the site educates, enlightens and creates an awareness of the traditions of the Hindu faith. 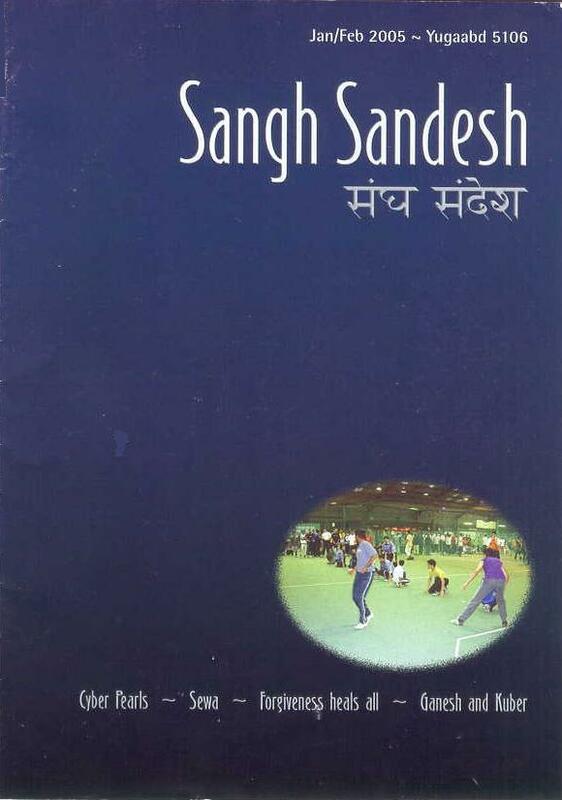 It explains and successfully removes many common misconceptions and misinterpretations surrounding rituals and worship, dispelling confusion and instilling a sense of Hindu pride. 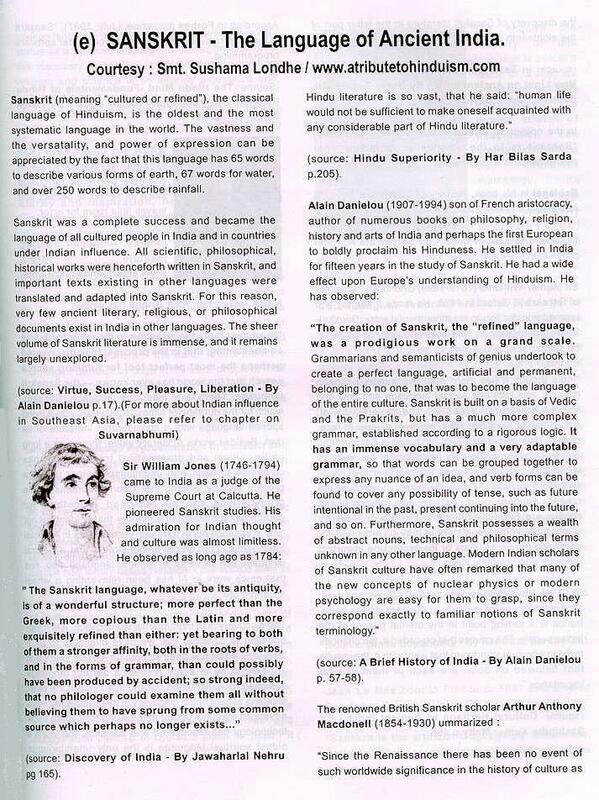 In 2003 WE REVIEWED THE SITE, “A Tribute to Hinduism,” an encyclopedic resource by Mrs. Sushama Londhe. Started in the Internet’s early days, in 1996, her site, now called www.hinduwisdom.info, has evolved into one of the most comprehensive and authentic resources on Hinduism in the digital info sphere. The site’s simple organization under Quotes, Basics, Science, History, Social and Other categories belies the breadth and depth behind the links. With a focus on Hindu pride in the face of Western ideological imperialism, Sushama organizes subjects with outlines to draw together hundreds of authoritative quotes, book excerpts and links to external websites into a powerful educational framework. Noteworthy are the abundance of quotes by Westerners in support of Sanatana Dharma. Tackling misinformation about Hinduism “head on,” the pages on conversion fearlessly expose the fallacies behind Western Christian and Islamic assertions of exclusivity. The page on the caste system is one of the best resources on the subject we have ever seen. And for a real thriller, don’t miss the page “ India on Pacific Waves” with citations of all the evidence that indigenous Americans, Incan and Mayan cultures came from India. Featured is Sushama’s book, A Tribute to Hinduism. Recently, while trawling the Net, I stumbled upon a fantastic website about Hinduism. This site is a labour of love, painstakingly put together brick by brick over the years by Sushama Londhe, an Indian American. It is different from other sites on Hinduism which usually start and end with explaining esoteric Hindu philosophy. What Sushama has done is that she has handpicked thousands of quotes from influential people throughout the world (historians, scientists, linguists, thinkers, intellectuals, professors) about Hinduism and Indian history and culture, basically everything that is the intellectual produce of the land over thousands of years. The site has now become so vast, you can spend days browsing it. Sushama has done a great job by adopting this unique strategy of collecting quotes. This is because the first introduction of most Hindus to how the outsiders view and assess Hinduism and Indian culture is through mischievous missionary propaganda of “cow, curry, caste.” This is unfortunate because this barrage of hate speech (missionaries are after all vending a competing product) leaves Indians confused and they become embarrassed and defensive about their identity. Hindu Wisdom does the opposite. It tells you what the intellectual class of other races really thinks about Hinduism. And it is a matter of great pride for us to have inherited this spiritual literature and culture that no other race has been able to produce. The site has now been turned into a book called “A Tribute to Hinduism.” The best thing you can do is to gift this book to ignorant and alienated Hindu youngsters who are usually more clued into coke and pizza than their own religion and culture. After reading the site, one does tend to feel pride about the ancient Indians and what they have handed down to us, which is actually a treasure for entire humanity. One can only imagine that if this heritage had belonged to Westerners, how they would have gone about beating drums to its glory in front of the rest of the world and how they would have argued that this proved their race was on a different level of evolution altogether. Indians are indeed poor salesmen. The Commemorative Sanskrit Souvenir 2003 of the Bharatiya Vidya Bhavan - Puthucode Kendra Kerala, India.